I thought this came together pretty well and I had a great time presenting my first revision of A Techcomm Bestiary at STC Rochester’s Spectrum 2014. 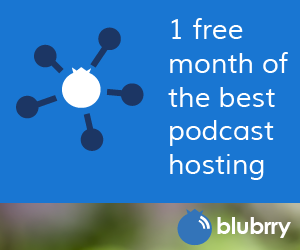 I may make a couple of slide changes before the STC Summit, but this is the meat of the presentation. Putting this talk together was quite the experience, as I wandered through online pix from medieval bestiaries, reviewed techcomm roles, and read a little about animal symbolism. 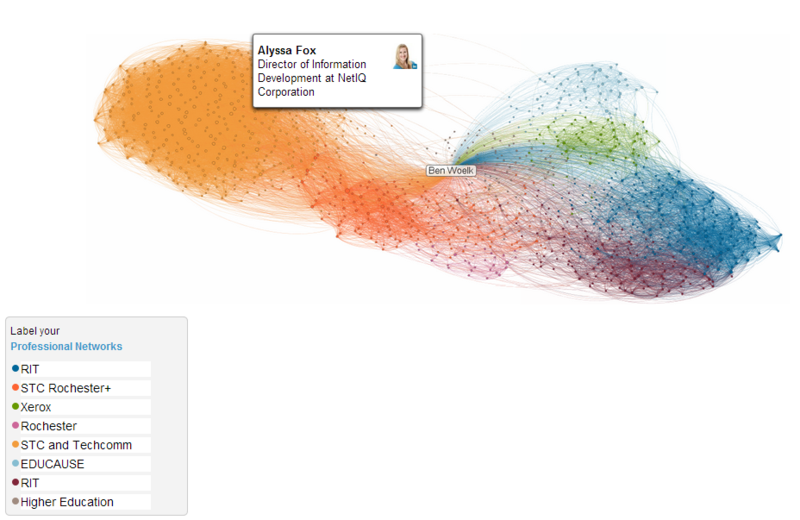 Did you know that LinkedIn Labs provides a graphical representation of your professional network? It’s similar to a hyperbolic browser I saw demonstrated several years ago in a research facility in Silicon Valley. The map allows you to hover over each point and provides a popup of your connection. After spending last week at the STC Summit conference and adding many contacts to LinkedIn, I thought it would be fun to take a look. Here’s a picture of my network, highlighting one of my favorite connections. You’ll note that the connections are clustered in several different groups, representing my involvement in two professional organizations, higher education, and the corporate world. LinkedIn provides a short video overview of the connections map. Do you find this type of graphical representation useful? Why or why not? 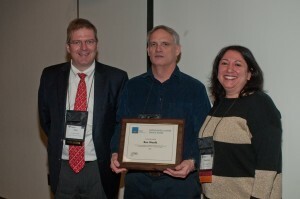 Ben Woelk Receives STC Distinguished Chapter Service Award | STC Rochester Chapter. I was truly humbled and honored to receive the Society for Technical Communication‘s Distinguished Chapter Service Award (DCSA) for my work over the last few years with the Rochester Chapter. For your unwavering dedication, willingness to initiate innovative activities, and wholehearted support of the success of the Rochester Chapter. Volunteering with STC Rochester has provided an opportunity to gain leadership skills and discover my talents. I encourage you to serve in your community.